Gujarat Adijati Vikas Corporation has announced an Official Employment Notification to recruit 402 Vidhayasahayak Bharti Grant-in-Aid ST Ashram shala. 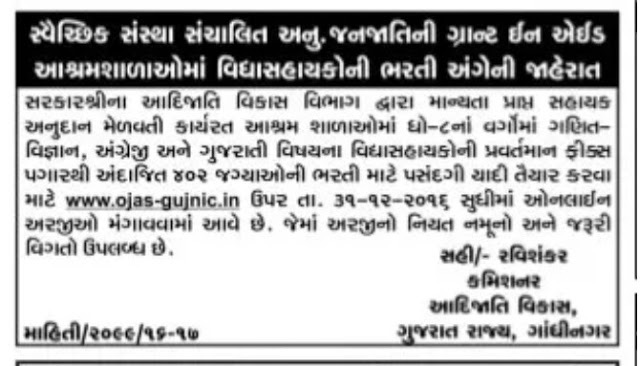 Eligible candidates may apply online at www.ojas.guajrat.gov,in before 31-12-2016.more detailed information regarding educational qualification,age limit,selection procedure,how to apply ,last date for Gujarat Grant-in-Aid ST Ashram shala 402 Vidhayasahayak Bharti 2016 are mentioned below.Eligible candidates may apply in the prescribed application format before last date 31-12-2016. Other details like age limit, educational qualification, selection process, how to apply are given below. apply Online through website www.ojas.gujarat.gov.in before 31-12-2016.